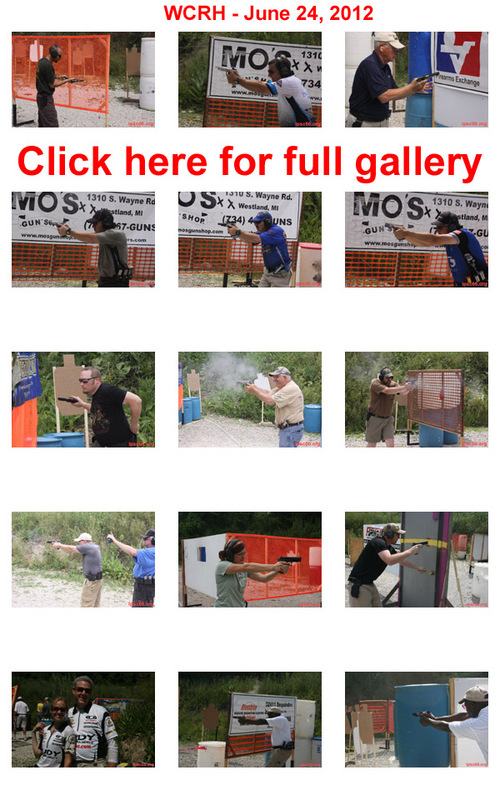 With 82 competitors, this was the biggest USPSA match held at the Raccoon Hunters in a long time. Practical pistol shooters ranging from GM to first timers from Ohio, Michigan, and Canada represented every division making for a fun and (sometimes) interesting day. Production and Limited divisions were equally represented with 24 shooters each followed by Open, Single Stack, Limited 10, and a sole brave revolver shooter. You got to admire the revolver shooters that come to a Raccoon Hunters match. Five of the eight stages were 30 rounds or more and absolutely no consideration is given for a revolver friendly stage at WCRH. Stage designers, Roy Neal and Mike Dame had attended a class a few weeks before and recently shot at some major matches giving them plenty of ideas to challenge everyone. As usual, there were eight stages consisting of seven field courses and a USPSA classifier: Front Sight 2 (99-24). Because of the large number of attendees, it was necessary to form eight squads. This put a squad on every bay at start. The ROs and squad members did an excellent job at keeping things moving smoothly and there were no major hold ups even with all the steel, drop turners, swingers, and many many targets that needed to be pasted in a 218 round local match. Someone needs to find something for Mike to do in his spare time. A big THANK YOU to those who stayed after to help tear down and stow the props. After everyone was done and scores were compiled, we were still finished by four o’clock. Just as the rain started. You don’t get much better than that at a local match!